Also introduces two limited-time modes. Epic has made another update to Fortnite, this time introducing the long-awaited Heavy Sniper Rifle. The Heavy Sniper Rifle has been known about for several weeks, as it was stumbled upon by StormShield.One dataminers back in July, but it hasn’t been formally added into the game up until now. The rifle deals a mighty 157 points of damage to players, but its primary focus seems to be as an anti-building weapon, as it dishes out a whopping 1100 points to structures. This comes at a cost of a relatively lengthy reload time, but it's still a formidable weapon. Intriguingly, alongside the rifle’s addition, Epic has removed scopes for assault rifles. This suggests it’s trying to widen the gap between play styles, forcing players to choose between long-range weapons with slow firing rates, and short-range weapons with faster firing rates. 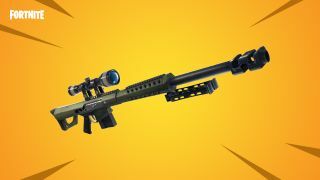 The update also introduces two new limited-time-modes, including the return of Sniper Shootout, which limits players to using sniper-rifles only. The other mode is called Soaring 50s, which Epic describes as “a twist on the traditional 50 vs 50 mode, featuring an extra emphasis on mobility.” It allows players to deploy gliders when falling from large heights, while spawning additional Impulse Grenades, Bounce Pads and Launch Pads. Basically it turns Fortnite into a gigantic bouncy castle, only it’s the kind of bouncy castle where just one child emerges at the end of the party. Fortnite: Save the World gets a bit of love from the update too. It adds a new character called Thora, who can lure husk enemies into traps. This comes bundled with a new weekly challenge mode named "bulletproof husks", presumably designed to let players test out Thora's abilities. You can stick your head above the parapet and read the full list of changes here.